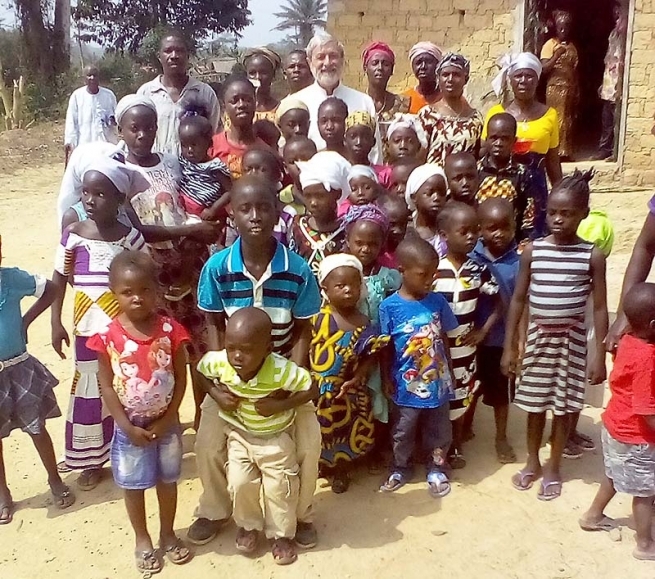 (MissionNewswire) A new Salesian missionary, Father Riccardo Castellino, recently joined the Salesian mission in Tappita, a village 400 kilometers away from the Monrovia, the capital city of Liberia. The village is in the middle of the forest and far away from towns and cities. The last 100 kilometers to the village are impossible to travel across during the rainy season. For weeks at a time, residents are cut off from access to the capital city, where there are goods, supplies, medical assistance and other basic needs. People commonly travel by motorcycles and, in the dry season, a huge dust cloud is raised as they travel. At best, people need three hours of being jolted around on the terrain before reaching the asphalt road and continuing for another 300 kilometers to Monrovia. The village has no mail or newspaper delivery, but today, thanks to the internet, they are not as cut off from civilization as they once were. A market is held once a week. People come from the surrounding villages to find items they don’t have back in their communities and to meet with others. People in the village survive with traditional agriculture. They are able to eat what they can hunt but have no money. Tappita has electricity, but the Salesian parish never has had enough funds to plant the poles and pull the wires to the mission building. Missionaries have to charge computers, mobile phones and batteries in the three hours a day they run the small generator in the evening. Missionaries live and work among the local people providing Catholic mass and assistance to those in need. Liberia is one of the poorest countries in the world with 64 percent of its population of 3.5 million people living below the poverty line, according to the World Bank. The 2015 Human Development Index ranks Liberia 177 out of 188 countries in the world. Still recovering from the effects of a 14-year civil war that ended in 2003, Liberians struggle with social and economic hardships. Those living in rural areas make up close to 75 percent of the country’s poor. The World Bank classifies Liberia as a low-income, food-deficit country, reporting that half of the population is food-insecure or highly vulnerable to food insecurity. Orphans, street children and adolescent ex-combatants often find themselves on their own facing adult responsibilities with little support and no education.